It was over two years ago when we found ourselves at a crossroads on our journey to a baby. After exhausting our insurance-covered intrauterine insemination (IUI) cycles, we decided to take a small break from fertility treatments. We had just bought a new house on the edge of St. Paul, complete with front porch, big windows, and three bedrooms, at least one of which we desperately wanted to fill with a crib and rocking chair in the near future. Oh, and a baby too. One evening, I found myself on the Google machine, every infertile’s most favorite/loathed method of fact gathering. One thing led to another and before I knew it, I was learning about embryo donation, also referred to by some as embryo adoption. I was fascinated as I read the stories of others who successfully grew their families in this unique way. Instead of doing traditional IVF by creating embryos with their own egg and sperm, an individual or couple received already created embryos from people who no longer wanted to use theirs. These embryos were originally made for another’s use, but in most cases, the people had completed their families and wanted to donate them. Sometimes divorce or death of a partner is another reason a person chooses to donate. Other options for unused embryos are to donate the embryos to scientific research, continue to store them indefinitely and pay an annual storage fee, or let them thaw and arrest without transferring them to a waiting uterus. Another option is thawing them and transferring them into a uterus, but during a point in the woman’s cycle where a pregnancy is highly unlikely to work. Whatever decision is made, none of them come easily or with little thought. My hat is off to anyone faced with this decision. I was convinced we’d be perfect candidates for embryo donation. We’d gotten to the point in this painful process where a child that shared our genetics wasn’t a top priority. In fact, the more we talked about it, it wasn’t really a priority at all. To us, a child of our own didn’t have to share my chin or my husband’s wide grin. We just wanted a child to love. Financially we found ourselves stuck, as we couldn’t afford a full round of IVF and the risk of having nothing to show for it. But embryo donation boasted similar success rates, but at a much more affordable price. And you were almost automatically guaranteed an embryo to transfer, especially if you were being donated more than one. So we did it. We adopted us some embryos. We connected with an awesome family that had three embryos to donate. Given we were doing a known donation, things proved to be a bit trickier. There was physical testing involved for all four of us, legal paperwork drawn up, and in-person counseling at our clinic. These things weren’t initially anticipated, so the cost did end up being significantly higher than we anticipated. Using anonymously donated embryos can oftentimes be less expensive. But at the time, having a connection with our donors was important to us. The extra money, while hard to come by, would be worth it. Roughly ten months after we matched with our donors and had a successful fundraiser thrown for us to help come up with the rest of the money we needed, I was prepping my body for our first embryo transfer. And it worked. During my eighth week of pregnancy, our baby’s heart had stopped beating. We had seen the little flicker on the screen two other times. Certain we’d see it again for a third time, our breath was sucked from us as we saw a much different image on the monitor. We later learned our sweet little one had a chromosomal abnormality that wasn’t compatible with life outside the womb. While we were grateful that the pregnancy ended within the first trimester and didn’t proceed further, we were devastated to lose this baby after four years of trying to conceive. It seemed so cruel. It was so cruel. After healing, both physically and emotionally, we decided to pursue a second transfer with one of our other two embryos. This time, the pregnancy ended in a chemical. The embryo implanted, but just didn’t continue development past a few days. Heartbroken again, we waited a few months, took a vacation, and circled back around to our third and final embryo. This one just had to work, right? Third time’s the charm! But again, it was another chemical pregnancy. We were out of embryos and pretty sure we’d be closing the door completely on embryo donation as way to build our family. We’d spent over $20,000 at this point and it seemed crazy to keep spending more on something that hadn’t been successful with three attempts. We took a break to regroup. At the time, I felt we were done completely with embryo donation. We began filling out some paperwork for an adoption agency. We also found out that our insurance was willing to cover more IUI cycles. We simultaneously pursued the adoption path and did a few IUI cycles, as well. To our surprise, we actually had success with one of the IUIs. I was pregnant again, and this time it was with our biological child. Sadly it was short lived, and at 6 weeks, we lost another baby. It ended up happening on the same exact date as our first loss the year prior. How is that even possible? Weirdest, hardest, most heartbreaking year ever. What does a couple do when they find themselves in this place? Honestly, I can’t remember what we did those first few weeks after our second miscarriage. We simply existed and vowed to survive the holidays and talk about next steps in the new year. It was nearing Christmas when I got an unexpected call from the clinic where we did our three donor embryo transfers. They were letting us know that they had some new profiles for us to view and possibly adopt if we were interested, but this time they would be anonymously donated. We never anticipated this happening, but after a few conversations, we decided to go for it again. We soon matched with another batch of embryos, and soon enough I was prepping my body for another embryo transfer in February. And this time it worked. And it’s still working. As I write these words, I am fast approaching my second trimester, and we just found out we are having a little girl. She is due to make her arrival sometime in early November. Since our last two Novembers included two miscarriages, it is exciting to finally be anticipating the arrival of our daughter. We’re so grateful and we just can’t wait. 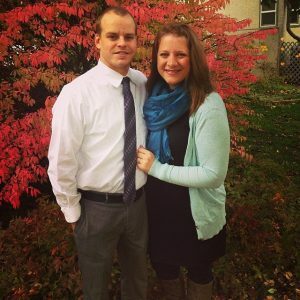 Lauren lives in St. Paul, MN with her husband of 5 years, Jesse, and their two dogkids, Apple and Bobo. She works as a nanny for several delightful families, and also collects an obnoxious amount of vintage Pyrex bowls. Since learning her and her Jesse were facing infertility, she's made it her mission to be a vocal advocate for the 1 in 8 facing infertility.